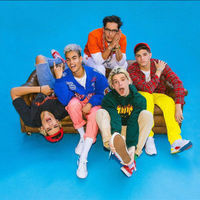 AUSTIN PORTER, BRANDON ARREAGA, EDWIN HORNORET, NICK MARA and ZION KUWONU were all making music in their respective hom towns before SYCO music founder and entertainment mogul Simon Cowell discovered and invited them to a music showcase in New York. There, the band bonded and PRETTYMUCH was born. Since last year, they have been sharing a Los Angeles home with their vocal group writes, records, and produces their music - with dance skills to match.